It’s never too early to educate our children about protecting the environment. That’s why we work together with schools to promote and teach students how to use bins responsibly, and recycle as much as possible. As part of our commitment to achieve this goal, we offer schools a chance to visit our recycling and landfill facilities, to see firsthand how to make a difference. 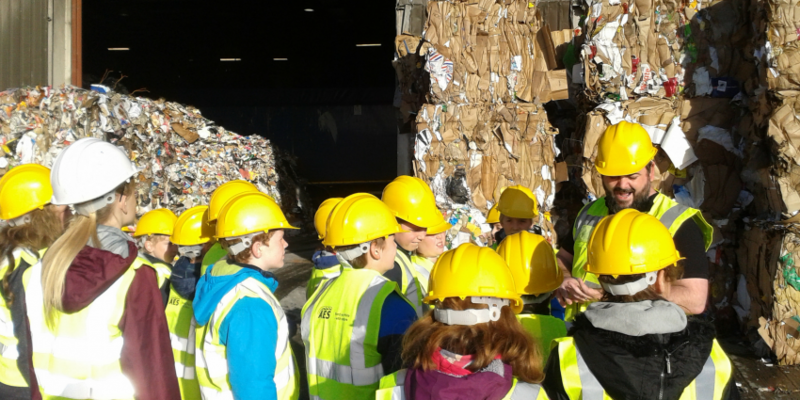 Our recycling facility in Tullamore has already hosted many student tours. Our tours are suitable for primary schools (3rd class and above), second and third level students. The tour is ideal if you are teaching a class about Recycling and Waste Disposal. Your group will learn what materials are collected for recycling and how they are processed. As tours are hosted outdoors, they are subject to weather conditions. Students are requested to dress appropriately, by wearing suitable footwear and outdoor clothing. We also have an education room in Tullamore, which is more suitable to younger classes. Here we can teach them the do’s and don’ts of recycling, and what they can do to reduce, reuse and recycle. At the end of their tour, groups will be given a quiz on recycling to see what they have learned. This tour will show students what happens to their waste, after we collect it from their bin. It will include a tour of our landfill gas power plant. If available, the children will get to meet our resident Birds of Prey and will learn of the bird’s role at the landfill site. This tour also highlights the need to recycle more and teaches children the challenges of dealing with today’s waste in Ireland. As this tour is outdoors, students are again requested to dress appropriately and wear suitable footwear and outdoor clothing. This tour shows the various stages of our composting process. There may be an opportunity to step inside the Compost Facility but this is not always possible. Again, students are requested to wear suitable clothing and footwear to ensure their protection. Tours are available throughout the year, however restrictions may apply at certain times of the year. High visibility vests and hard hats will be provided. Wellington boots are a must! Please note that we are restricted to the number of students we can show around our facilities at any one time, so larger groups may need to be split into smaller groups to ensure safety at all times. For more information on any of our tours, please contact us at education@aesirl.ie with details of your school, contact name, contact number and a brief description of your proposed tour. We are happy to facilitate groups who may have special requirements. Please contact us and we will do our best to tailor a tour to suit your needs. We can also provide a range of additional resources to assist your school in achieving your Green Flag goals. We have some downloads below to help you learn about recycling, and how you can improve the recycling in your school.